Love is the topic for today. Love…rhymes with glove, which is interesting in ways I have yet to think of. Perhaps something about it sheathing the hand or something to do with fingers. Unpleasant and leathery. I have been scribbling away in my sporadic manner, and I have found myself describing a scene where the thorny issue of love has raised it’s head. I am sure that many writers out there absolutely LOVE a bit of the old romance – it appears to be easy for them, although I have not looked into it (that spanks too much of research which itself spanks too much of organised effort, which all right-minded people should avoid at all cost). But I find the whole process enormously ridiculous, despite its necessity. Or perhaps because of that necessity. Of course, LOVE is a part of life, as much as tedious local TV news and the rightful aversion to camping out, and as such it should feature in my character’s lives, but why do I find it all so, well, embarrassing? Can it be my Britishness? We do have an aversion to overt expressions of intimacy or feelings (at least we did prior to 1997…Lady Di and all that….wow…talk about over the top. Thanks US). Or could it be more personal? Probably the latter. It’s not a big issue, don’t get me wrong. I can write romantic shash until the cows wend their way back to their barn-of-birth, but while I am doing it I am realising with increasing annoyance that it IS shash. To me it seems that any real attempt to impart the feelings that occur in a romantic triste cannot help but be tawdry, tedious and contrived. It is so subjective. Romance is the bedrock of a lot of stories, as is action, adventure and a beginning and an end, but the extent to which it features is up to the author. I am going to be careful that it does not become a central theme, which I admit is a decision of personal taste. I’m just not going to dwell on it. I’m going to be doing the equivalent of sitting down, having a cup of Yorkshire Gold and being sensible about it, like a good old fashion Brit. I prefer it that way. All the above is an excuse to post this drawing of mine. I LOVE IT! Love (as a blog topic)- now, that’s progress! 😉 Is that a giant man/rabbit? If you put some antlers on it you would have what we, here in the Great American Southwest, would call a ‘jackalope’ (half jack rabbit, half antelope). It’s not a giant man/rabbit, it’s just a giant rabbit in a jacket. Why is the Great American southwest called ‘Great”? What’s so great about it except that it (reputedly) contains mutant anthropomorphised giant beasts? I ask this in a non-mocking way, incidentally (a re-read gave me concerns!). Hmm, I have my doubts about that, but I’ll answer anyway. 😉 I thought that you may have visited here from your depiction of the cactus, wide open road and general desolation. And although our jack rabbits are pretty big, they don’t go around wearing jackets. Unfortunate. 😉 And that kind of cactus actually doesn’t grow here in New Mexico, only in Arizona…To be honest, I hated the place when we first moved here. I missed GREEN (as in trees, grass, foliage) and the water that provides for it. But I have to say it grows on you over time. You’ll never see more beautiful blue skies, colorful sunsets or terrifying lightening storms The food is to DIE for: it’s green chile roasting season here and the aroma wafts through the air everywhere you go…MMMM! It truly has a beauty and uniqueness all it’s own. It’s still the old, Wild West of lore in many ways: landscape, culture and state of mind; a fascinating and frustrating place to live. New Mexico, much like the rest of the Southwest, is a mix of Native American and Hispanic cultures (that’s the fascinating part). The frustrating part is that it sometimes feels like we live in Old Mexico- where time stands still and the world progresses without us while we take a little ‘siesta’. But that’s part of that state of mind that I’m talking about (which can be good and bad). “Manana” or “tomorrow”. Whatever it is can wait until tomorrow. How was that? 🙂 (I write a lot about the Southwest, or living here, I should say on my blog). Apologies for the geographical and botanical mistakes, but that’s what happens when you research as thoroughly as I do for a cartoon. Fair does, though, the southwest sounds nice. I live in North Yorkshire. It is damp, usually. Beautiful and damp in places, f******g awful and damp in others. I guess the point I’m trying to make here is it’s damp. I am slightly jealous that you get to have a whole quarter of the US to live in and I only get a county. It doesn’t seem fair, but then I remember I like the damp and it’s all ok. Can we be more diametrically opposed in virtually all ways? I’m always happy to discuss my views on eggs…:) Back to your original post, though, I forgot to say that while I don’t understand the whole giant rabbit in the jacket part of your well-drawn cartoon, or why he’s walking with Butch Cassidy down a lonely highway (did their car run out of gas? Did a giant rabbit wearing lipstick and a tutu steal it? 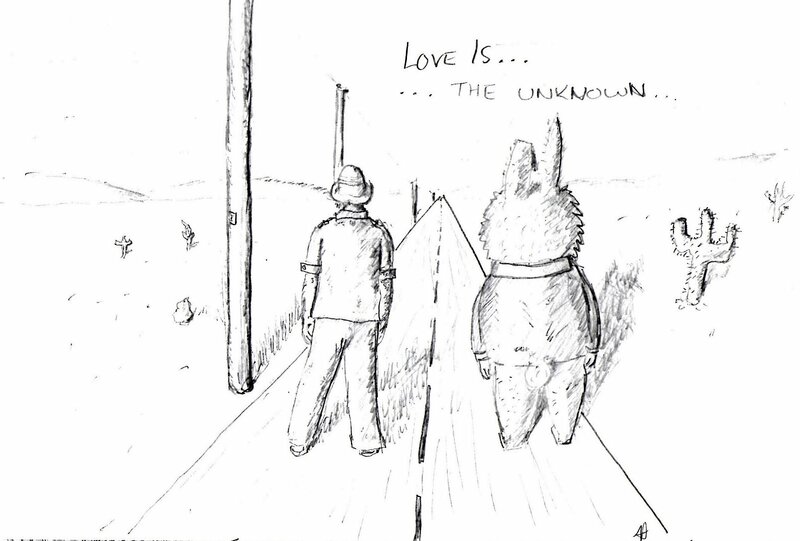 ), I think the notion “Love is… the unknown” is actually a brilliant jumping off point for any character in a story, because that is reality- anything can happen with relationships. It’s all up to you, the writer. That’s the fun of it, in my opinion.